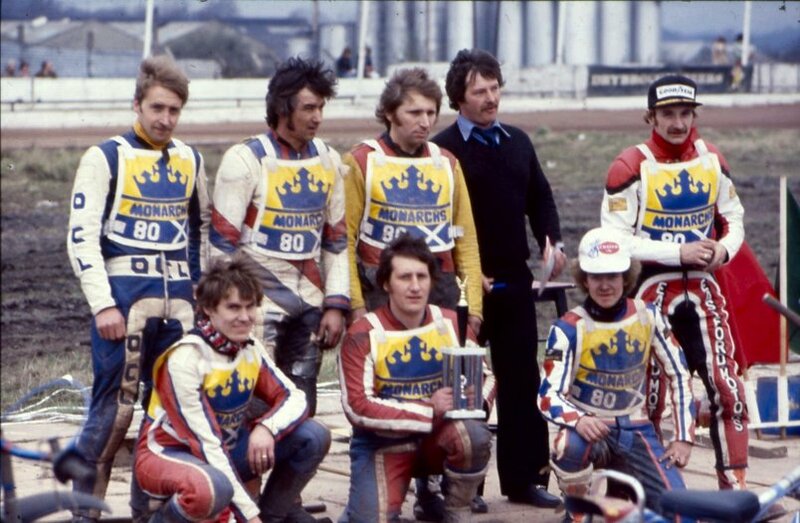 Perhaps we would not put the Inter-City Cup of 1980 as one of our greatest victories, but we always like beating the Tigers, and it gives us a chance to show this team photo taken at Blantyre - the first venue there. This was on Sunday 13th April, our third match of the season. We had only brought a 4-point advantage from Powderhall on the Friday but managed a draw at the notoriously tricky Blantyre. It was the start of two excellent seasons in which Neil Collins became our most exciting performer. In this match though George Hunter was the star with 10+1 and a win in the last heat decider. Our riders are: (Back) Benny Rourke, George Hunter, Rob Mouncer, Alan Bridgett (manager), Dave Trownson. (Front) Harry McLean, Brian Collins, Neil Collins.